V is proof that a TV miniseries can be well-made and stand the test of cinematic time. Yes, it's got a number of 1980's giggle-worthy moments but, by and large, it's well made and well acted. The main thing that makes V work is it's intelligent screenplay. It starts with visiting aliens that appear as menacing as your grandma. Then, slowly, details are added which make you realize they are visiting earth with evil intent. The build-up is near perfect and makes for enjoyable TV watching. I remember watching this when it first came out. I was a fan of Marc Singer who had a hit a year earlier with The Beastmaster. He plays a TV cameraman in V and nails it perfectly. However, the best surprise is the appearance of Robert England who would become Freddy Krueger in A Nightmare on Elm Street the same year. His role as the lovable alien Willie is quite a contrast from the menacing Freddy, which goes to show his underrated range as an actor. One of my favorite scenes is when Singer boards one of the alien ships and ends up tussling with one of them when his hiding place is discovered. As the human mask of the alien is pealed away, it reveals a reptilian creature whose face is well done and effective. 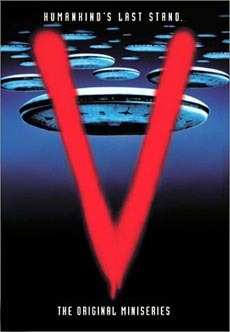 V would spawn another miniseries, V: The Final Battle (1984), and two TV series which ran from 1984-85 and 2009-11. I am especially fond of the latter version that is one of the finest remakes out there. If you're a Sci-Fi fan and haven't seen the original, what are you waiting for?